You don’t need to be a basketball fan to appreciate the 2018 NBA Finals. You just have to be a fan of free tacos. That’s because Taco Bell is offering a massive, nationwide free food deal for this year’s hoops tournament. 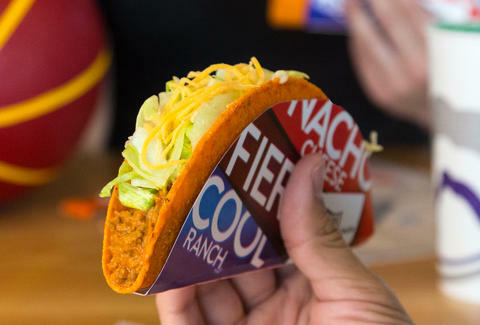 On Thursday, the Chalupa purveyor confirmed it will again stage its “Steal a Game, Steal a Taco” giveaway, promising everyone in America a free Doritos Locos Taco. For the third year in a row, the chain will hand out the free tacos at its locations across the United States if the away team wins, or “steals,” a game on the home team’s court during the tournament, which begins May 31. Given the likelihood of this happening, you’re all but guaranteed a free lunch, thanks to basketball. Here’s exactly how it works: If the road team wins Game 1, Game 2, or Game 3 of the Finals, everyone gets a free Doritos Locos Taco on Wednesday, June 13, from 2pm to 6pm (local time). If the road team wins Game 4, Game 5, Game 6, or Game 7, everyone gets a free Doritos Locos Taco on Wednesday, June 20, from 2pm to 6pm (local time). Judging by how it played out in previous years, the deal will be triggered sooner rather than later. Last year, the Golden State Warriors stole everyone a taco when it defeated the Cleveland Cavaliers in Game 3. In 2016, the same rivalry led to a free taco feeding frenzy when the Warriors beat the Cavaliers in Cleveland in Game 4. Millions of free tacos were eaten. Of course, it remains to be seen which teams end up in the finals this year, but the good news is that it doesn’t really matter who you end up rooting for. You’re probably going to get a free taco no matter what. Team Free Food FTW. Tony Merevick is Senior News Editor at Thrillist and already has a few packets of Fire Sauce ready. Bring on the tacos. Send news tips to news@thrillist.com and follow him on Twitter @tonymerevick.